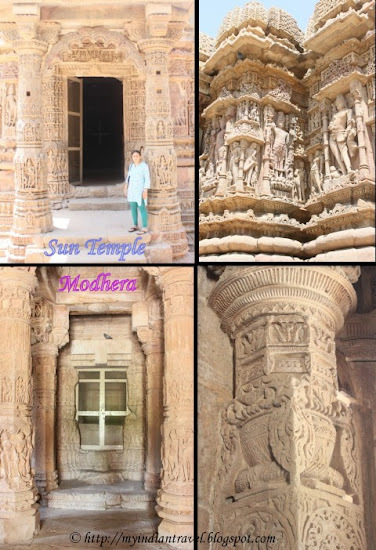 Sun Temple at Modhera is one of the architectural marvel in the state of Gujarat. The temple that was built in 1026 AD has a unique architecture is most important Sun Temple in the whole of Gujarat. The temple dedicated to Sun God was built by Rushabh Bhimdev I of Solanki Dynasty. The whole structure standing on a basement consisted of the Garbhagrha, Guha Mandapa, Sabha Mandapa. In front of the temple is the sacred pond called the Surya Kunda. The Guha Mandap is the main temple with sanctum is a rectangular structure, with its length inside the walls 51 feet that is almost double of its width of 25 feet. It was designed so that the rays of the rising and setting sun on the day of Summer solstice and not equinox falls on the idol of Sun. Unfortunately there is no idol in the temple as in the olden days it was plundered by Mahmud Gazni. The Sabha Mandap is a magnificent pillared hall that has been carved ornately. It is open from all sides and has 52 intricately carved pillars. The exterior of the temple walls has been carved exquisitely with 12 different postures of Sun God along with various other deities. Between the Sabha Mandapa and the Main Sanctum is a beautiful hall with exquisitely carved pillars and arches. The Surya Kunda is a large rectangular stepped tank under the east face of the Sabha Mandapa is used to store pure water. Devotees were required to perform ceremonial ablutions here before worshipping the Sun God. Wow ! Superb architecture and sculpture ! Nice shots of the wonderful architecture. As always, you have very beautiful photos! Thank hou! Our ancestors knew so much about the position of the sun, it is no wonder it was idolised. An awesome, incredible temple, Rajesh!! And superb captures, as always!! Thank you for sharing!! very impressive. i specially like the last photo. I really enjoy the temple design and all the columns. Wow! look at the work on the roof and walls and pillars. Truly amazing! Amazing work in stone! Great shots! How long did it take to build those structures? What a beautiful architecture ! Truly incredible temple complex! Man had done marvel allover the walls and pillars. Really wonderful compositions and frames on the Mandaps, Rajesh. Truly amazing architecture .I know I keep saying this but it really is. Beautiful temple and lovely photographs! I love it - especially in the second shot it looks sunny and bright. Astounding! Was this carved out of one rock? The delicateness and intricacy out of rock is mind-boggling. Really interesting, thank you for sharing ! How incredibly gorgeous. What a beautiful sight to see. Beautiful building. Have a lovely weekend. Beautiful place, very nicely taken.